Background & objectives: Black flies (Diptera: Simuliidae) are ecologically and medically important insects. Female adults of black flies are the solitary vectors of river blindness (onchocerciasis) and their larvae play a vital role in stream ecosystem. This study examined the distribution of black flies in the Oriental region and analyzed the phylogenetic relationship of the subgenus Gomphostilbia members based on two molecular loci. Methods: The distribution data of black fly species in different countries of Oriental region were obtained from world black flies geographic inventory. The two gene sequences, COI and ITS1 were used to study the phylogenetic relationships of the members of subgenus Gomphostilbia members. Results: The distribution analysis revealed that out of the 16 subgenera in the genus Simulium Latreille s., the species-level diversity of three subgenera (Gomphostilbia, Nevermannia and Simulium) contributes about thrice of total black fly species diversity. The highest diversity of species was found in the subgenus Simulium. The strict consensus of Tree analysis using New Technology (TNT) and Maximum Likelihood (ML) recovered similar topologies for Gomphostilbia members and they formed as monophyly. The overall sequence identities of the 19 species of subgenus Gomphostilbia were high and shared 55–60% similarity. 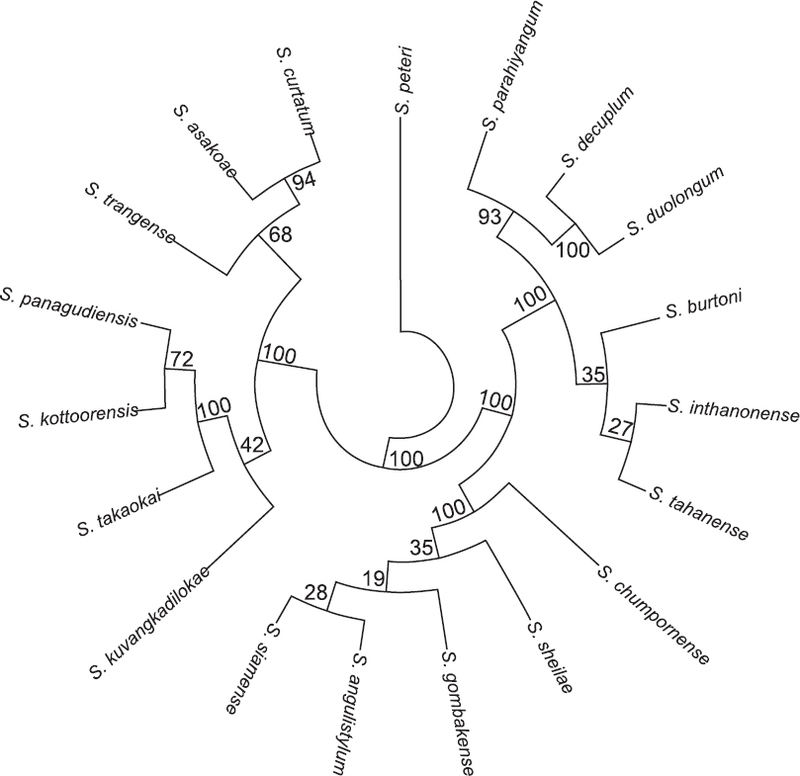 Interpretation & conclusion: Results of this study highlighted that eight subgenera of Simulium Latreille s. str are commonly distributed in different parts of Oriental region. Among these the subgenera of Simulium, Gomphostilbia and Nevermannia are most common with high diversity in China, Pakistan, Thailand and Vietnam. The phylogenetic analysis of Gomphostilbia members demonstrates the inter-specific divergence, indicating the centre of origin (India) or the recipient of ancestral migrant lineages in Oriental region. Oriental region is one of the most important biogeo-graphic regions of the world. It includes all the tropical parts of Asia mainly India, Pakistan, Myanmar, China, Sri Lanka and Philippines. The region exhibits variety of physical features and comprise very rich flora and fauna. Data are deficient for freshwater invertebrates except dragonflies and damselflies in the world’s zoogeo-graphic regions. Freshwater insects comprise, >60% of total freshwater animals. Of these, Diptera is the major representative (43%) of freshwater insects. The family Simuliidae (Order: Diptera) is distributed with the highest diversity in Oriental region next to Culicidae. The black flies (Simuliidae) are represented by 2177 living species and 12 fossil species, classified under 26 genera. In the Oriental region, black flies are represented by only one genus Simulium Latreille s.l. with 10 subgenera,. The nematocerous Diptera of black flies pass through four developmental stages wherein the first three stages (egg, larva and pupa) are confined to running waters. The adult females are perhaps best known for the bloodsucking habits and transmitting parasitic diseases to hosts, including humans. Larvae grow in massive numbers under favourable conditions in streams, attaining population densities of up to a million individuals/m, which considerably collect fine particulate organic matter in streams, and the massive amount of faecal matter produced by larvae act as crucial fodder for invertebrates and microorganisms3, 5-6. The phylogenetic analysis of the Simuliidae is a key factor for identifying the vector species. However, the research efforts to resolve the phylogenetic relationships of the genus Simulium to related subgenera are limited,,,. The monophyly of Simulium is incongruent with combined morpho-molecular analysis, while it is strongly related to many subgenera as per molecular sequence data of certain genes of cytochrome oxidase subunits I and II (COI and COII),, and inter transcribed spacers (ITS1, ITS2 and ITS4),. Currie and Adler predicted that >3000 black flies are potentially undiscovered morpho-species and sibling species in the world, with 17% contributions to Oriental region. Relatively few taxonomic studies have been conducted in this area, consisting mainly of isolated species descriptions and the region in particular lacks studies on black flies. The present study examined the geographical distribution of black lies in Oriental region, and analyzed the phylogenetic relationship of the subgenus Gomphostilbia members by using two gene sequences (COI and ITS1). In this study, four black fly species under the subgenus Gomphostilbia of genus Simulium were collected between January and March 2016, from their type localities in peninsular India which included Simulium (Gomphostilbia) peteri, Simulium (Gomphostilbia) takaokai, Simulium (Gomphostilbia) pangudiense and Simulium (Gomphos-tilbia) kottoorense. In the field, larvae and pupae were collected manually from stream substrates (leaf litter, boulders and pebbles) with a fine brush and forceps. The collected larvae were immediately preserved in 95–100% ethanol in the field. The mature pupae were separated and placed on wet filter paper in a small plastic container for rearing. It was kept in an incubator adjusted to stream temperature (21–27°C) for one or two days till emergence of adults. The emerged adults were identified and preserved separately in 99% ethanol. All specimens were deposited in the Insect Molecular Biology Laboratory, Department of Environmental Biotechnology, Bharathidasan University, Tiruchirappalli, Tamil Nadu, India. 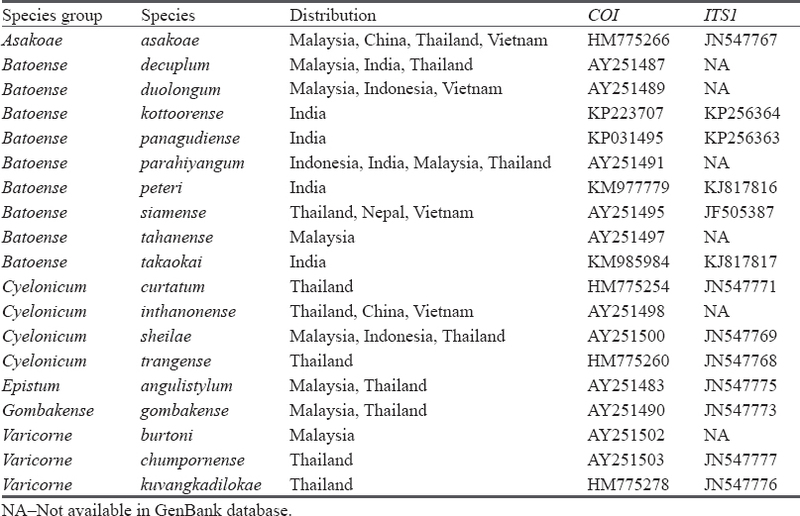 The COI and ITS1 gene sequences of 15 outgroup species in the subgenus Gomphostilbia distributed in different countries of Oriental region were selected from NCBI-GenBank database to study the phylogenetic relationships [Table 1]. Total genomic DNA was extracted from individual larvae of four black ly species according to the manufacturer’s protocol of the QIAamp genomic DNA isolation kit (QIAGEN Corning, Germany). The extracted genomic DNA was quantified by a spectrophotometer (Shimadzu, Japan) at 260/280 nm. The COI and ITS1 genes amplification was performed for the four collected species. The mitochondrial protein coding gene (COI) was amplified by polymerase chain reaction (PCR) using the primers LCO 1490 (5’-GGTCAACAAAT-CATAAAGATATTGG-3’) and HCO 2198 (5’-TA-AACTTCAGGGTGACCAAAAAATCA-3’). The nuclear ITS1 was amplified by PCR using the primers: 18s/sd5’ (5’-TGGTGCATGGCCGTTCTTAG-3’) and 5.8s/sd3’ (5’-GTCGATGTTCATGTGTCCTGC-3’). The PCR reaction (20μ1 final volume) was performed using the Exprime taq premix (Genet, Bio Inc., Korea) with the following volumes of reagents: 2 μl of DNA extract, 10 μl of Mastermix, 1 μl of each primer (10 mM), and 6 μl of sterile water. Each PCR reaction was performed using the following cycling parameters: 5 min at 94°C; 35 cycles of 60 sec (COI)/30s (ITS1) at 94°C, 60 sec at annealing temperature 58°C (COI)/56°C and 72°C for 60 sec, with a final extension at 72°C for 7 min. The amplified PCR products were identified by electrophoresis, using a 1% agarose gel and then purified using the Hiyield Gel/PCR-DNA Extraction kit (Real Biotech Corporation, Taipei, Taiwan). Finally, purified PCR products were sequenced by the automated DNA sequencer Model: 3500 (Applied Biosystems, Foster City, CA, USA). The COI and ITS1 sequences of the four species were deposited in GenBank database and their accession numbers are provided in [Table 1]. Contigs of COI and ITS1 were assembled and edited in SEQUENCER 5.0. Protein-coding sequence of COI was imported into MEGA version 6 for alignment according to amino acid. After determining the open reading frame of COI gene, sequences were translated to amino acid and then aligned with MUSCLE 3.7 program. The aligned amino acid was then back-translated to nucleotides, retaining the codon positions. The nuclear ribosomal gene of ITS1 was aligned using MUSCLE 3.7. Gblocks 0.19b was used for the ITS1 alignment with the most relaxed parameters (smaller final blocks, gap positions in final blocks, and less strict flanking positions) on the Gblocks server (http://phylogeny.lirmm.fr/phylo_ cgi/one_task.cgi?task_type=gblocks). The ribosomal gene was concatenated with the protein-coding gene using MacClade 4.08. Maximum parsimony (MP) analysis was calculated in TNT program using a heuristic search with tree bisection reconnection (TBR) and the ‘new technology’ search: tree drifting, sectorial searches, tree fusing and ratchet. The gaps were treated as missing. In TNT, nodal support for the MP tree was calculated with 1000 bootstrap replications, implemented through PAUP v4. In addition, maximum likelihood (ML) was used to resolve models of evolution for individual genes and the concatenated data set under the Akaike information criteria (AIC). ML analysis was calculated with 1000 replications using RAxML v7.0.4. This study analysed the distribution of black lies the Oriental region, a highly diverse region among the different zoogeographic regions of the world. 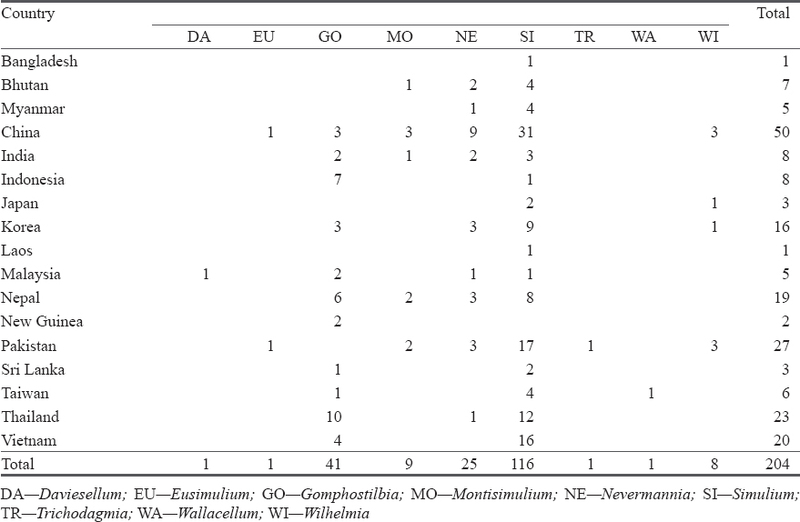 In this region, black flies are distributed in 19 countries [Table 2]. Approximately 1066 species have been reported under the 16 subgenera (Asiosimulium Takaoka and Chooch-ote, Boophthora Enderlein, Boreosimulium Rubtsov and Yankovsky, Byssodon Enderlein, Daviesellum Takaoka and Adler, Eusimulium Roubaud, Gomphostilbia Enderlein, Hellichiella Rivosecchi and Cardinali, Montisimu-lium Rubtsov, Morops Enderlein, Nevermannia Enderlein, Schoenbaueria Enderlein, Simulium Latreille s. str., Trichodagmia Enderlin, Wallacellum Takaoka and Wilhelmia Enderlein) within the genus Simulium Latreille s. The species within 16 subgenera accounts for 49% of total black fly species. On the other hand, in the subgenera Gomphostilbia, Nevermannia and Simulium, the species-level diversity contributes about thrice of total black fly diversity in the Oriental region. The highest diversity was recorded from China (27%), followed by Indonesia (12%) and Thailand (10%) [Table 2]. This study identified the species commonly distributed (20%) in nine subgenera in different parts of Oriental region [Table 3]. The most common species belonged to three subgenera (Simulium, Gomphostilbia and Nevermannia) primarly distributed in China, Pakistan, Thailand and Vietnam [Table 3]. The two gene sequences (COI and ITS1) were used to study the phylogenetic relationships of black flies. The ITS1 gene sequence data could not be obtained from GenBank for the following species: S. decuplum, S. duolongum, S. parahiyangum, S. taha-nense, S. inthanonense and S. burtoni. The alignments of contigs consisted of 2085 positions. Of these characters, COI and ITS1 made up to 685 and 659 bases. The two recovered topologies of ML and TNT were almost identical, differing only in the relative position of Gomphostilbia members. The ML tree reconstructed had a score of –6674.781 and the estimated Transition/ Transversion bias (R) was 1.17. Partitioned Bremer analysis totaled to –2274.99 and showed majority of the signal coming from the COI (59.63%) than the ITS1 (43.13%) gene. The strict consensus of TNT and ML showed similar topologies with some clearly resolved and well-supported branches [Figure 1]. In terms of mor-phospecies, 19 selected species of Gomphostilbia were monophyletic. Monophyly was highly supported between Anbalagan et al: Species diversity of black lies [Table 2]. 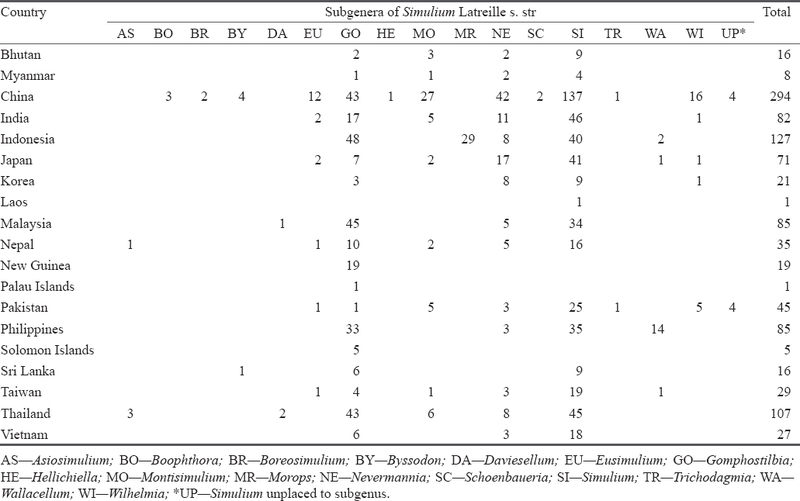 Total species diversity of the black flies (named and unnamed species) in the Oriental region 83 Country Subgenera of Simulium Latreille s. str Total AS BO BR BY DA EU GO HE MO MR NE SC SI TR WA WI UP* AS–Asiosimulium; BO–Boophthora; BR–Boreosimulium; BY–Byssodon; DA–Daviesellum; EU–Eusimulium; GO–Gomphostilbia; HE–Hellichiella; MO–Montisimulium; MR–Morops; NE–Nevermannia; SC–Schoenbaueria; SI–Simulium; TR–Trichodagmia; WA– Wallacellum; WI–Wilhelmia; *UP–Simulium unplaced to subgenus. 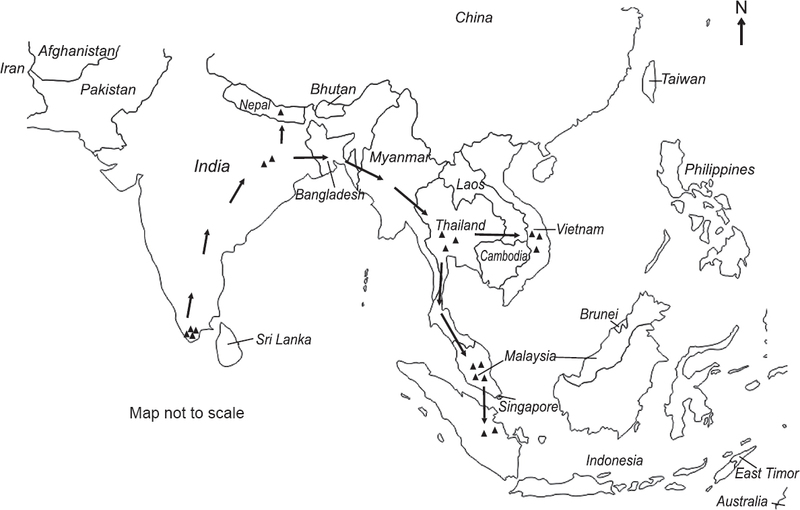 The results revealed that the 19 species from the Gomphostilbia members formed as monophyly and can be grouped into two major geographic clades, Indian subcontinent with Thailand, and Southeast Asia [Figure 1]. Simulium (Gomphostilbia)peteri from south India formed as a primitive species. Three species from India and four species from Thailand grouped in clade 1. The other 12 species from Southeast Asia clustered in clade 2. The phylogenetic tree showing the evolutionary trend [Figure 2] indicated that the genetic drift of species was from South India to Southeast Asia, with 100% BSS (TNT-100% and ML-97%). The overall sequence identities of the 19 species of the subgenus Gomphostilbia were high and shared 55-60% similarity. The genetic divergence ranged from 0.53-2.53, with 11 species having high divergence values as revealed by maximum composite likelihood model [Table 4]. Table 4. Estimates of evolutionary divergence in 19 black fly species revealed by maximum composite likelihood model. Figure 1: Strict consensus of the four most parsimonious trees of species in Simulium (Gomphostilbia) according to TNT program (Boot strap values are above the nodes). Figure 2: Geographical distribution and evolutionary trends of the black flies (based on two gene sequences by using TNT analysis). The highest diversity of freshwater insects is recorded from the Palaearctic (20%) and they are equally distributed in the Neotropical and the Oriental realms. Further, it has been reported that dipterans account for 43% of total insect species level diversity in the world. Of 16 subgenera, Gomphostilbia, Nevermannia and Simulium were the most diverse in the Oriental region. The subgenus Montisimulium has intermediate distribution, whereas the subgenera of Wallacellum, Wilhelmia and Eusimulium has limited distribution. The subgenus Asiosimulium has been reported in Nepal and Thailand, and Daviesellum recorded in Thailand and Malaysia. The subgenera of Byssodon and Trichodagmia were present only in Sri Lanka and Pakistan, respectively. The highest diversity of black fly species was observed in China, while Philippines showed most endemic fauna of black flies and most of them were not present in other countries in the Oriental region. The phylogenetic analysis of the members in the subgenus Gomphostilbia using COI and ITS1 genes showed more divergence with the existing morphological clas-sification. The result of phylogenetic analyses based on two gene sequences of Gomphostilbia members showed that they formed monophyly. These findings are in agreement with the phylogenetic relationship using COI and ITS1 genes,, and morphological assignment, of Gomphostilbia in the Oriental region. Further, Simulium (Gomphostilbia) peteri formed as a primitive species and sister to Simulium (Gomphostilbia) kuvangkadilokae with 100% BSS. This study supports the monophyly of Gomphostilbia members that were described based on morphological data. Recent researchers are commonly employing molecular methods rather than morphology of insects for carrying biogeographical studies. Similarly, this study investigated four black ly species from south India and their biogeographical considerations using the molecular approach. The geographical distribution pattern of black flies (Simuliidae: Diptera: Insecta) articulated at the species group and species levels than at the sub-generic level. 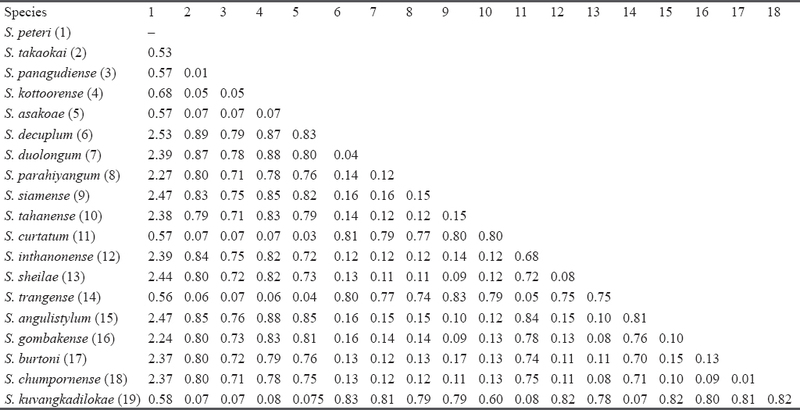 Nevertheless, subgeneric distributions are also significant. The subgenus Gomphostilbia is most abundant and diverse in the Oriental region in particular Southeast Asia. The subgenus Gomphostilbia is centered on the continental Islands of Sundaland, which is more important in the early evolution of the genus Simulium. Further, the southern and eastern Asia might be the centre of origin or the recipient of ancestral migrant lineages in the subgenus Simulium. The present phylogenetic study based on molecular approach, showed that the derived subgenus Gomphos-tilbia might have evolved in southern India and further diversified into northern India, throughout South and East Asia at a later date. Based on the results, the study hypothesize that Gomphostilbia became isolated in southern India, consequent to the spatial isolation of Madagascar and India during the breakup events of eastern Gondwana. This result is in agreement with the Out-of-Asia and Out-of-India hypothesis,,. Further, studies on the molecular phylogeny of black flies from South Africa, Madagascar, India and Southeast Asia are needed to understand the origin and evolution and estimations of divergence times. The authors thank Science and Engineering Research Board (SERB) (Ref. No: SB/FT/LS-102/2012 and ECR/2016/000191) for the financial assistance. The authors are grateful to Dr. H. Takaoka, Institute of Biological Sciences, Faculty of Science, University of Malaya, Kuala Lumpur, Malaysia for evaluating and reviewing the manuscript. Balian EV, Segers H, Leveque C, Martens K. The freshwater animal diversity assessment: An overview of the results. Hydro-biol 2008; 595: 627-37. Adler PH, Crosskey RW. World blackflies (Diptera: Simuli-idae): A comprehensive revision of the taxonomic and geographical inventory 2015. Available from http://www.clemson. edu/cafls/biomia/pdfs/blackflyinventory.pdf (Accessed on April 10, 2015). Currie DC, Adler PH. Global diversity of black flies (Diptera: Simuliidae) in freshwater. Hydrobiol 2008; 595: 469-75. Takaoka H. Morphotaxonomic revision of Simulium (Gomphos-tilbia) (Diptera: Simuliidae) in the Oriental region. Zootaxa 2012; 3577: 1-12. Malmqvist B, Wotton RS, Zhang Y. Suspension feeders transform massive amounts of seston in large northern rivers. Oikos 2001; 92: 35-43. Malmqvist B, Adler PH, Kuusela K, Merritt RW, Wooton RS. Black lies in the boreal biome, key organisms in both terrestrial and aquatic environments: A review. Ecosci 2004; 11: 187-200. Adler PH, Cheke RA, Post RJ. Evolution, epidemiology and population genetics of black flies (Diptera: Simuliidae). Infect GenetEvol 2010; 10: 846-65. Joy DA, Conn JE. Molecular and morphological phylogenetic analysis of an insular radiation in Pacific Black flies (Simulium). Systemat Biol 2001; 50(1): 18-38. Thanwisai A, Kuvangkadilok C, Baimai V. Molecular phylog-eny of black flies (Diptera: Simuliidae) from Thailand, using ITS2 rDNA. Genet 2006; 128: 177-204. Otsuka Y, Aoki C, Choochote W, De Las Llagas L, Takaoka H. Phylogenetic analysis of three subgenera: Asiosimulium, Davie-sellum and Wallacellum, of the genus Simulium s. l. endemic in the Oriental region. Med Entomol Zool 2007; 58: 329-33. Phayuhasena S, Colgan DJ, Kuvangkadilok C, Pramual P, Baimai V. Phylogenetic relationships among the black fly species (Diptera: Simuliidae) of Thailand based on multiple gene sequences. Genet 2010; 138: 633-18. Pramual P, Wongpakam K, Adler PH. Cryptic biodiversity and phylogenetic relationships revealed by DNA barcoding of Oriental black lies in the subgenus Gomphostilbia (Diptera: Simu-liidae). Genome 2011; 54: 1-9. Conflitti IM, Kratochvil MJ, Spironello M, Shields GF, Cur-rie DC. Good species behaving badly: Non-monophyly of black ly sibling species in the Simulium arcticum complex (Diptera: Simuliidae). Mol Phylogenet Evol 2010; 57(1): 24557. Folmer O, Black M, Hoeh W, Lutz R, Vrijenhoek R. DNA primers for amplification of mitochondrial cytochrome c oxidase subunit I from diverse metazoan invertebrates. Mol Mar Biol Biotechnol 1994; 3: 294-9. Simon C, Frati F, Beckenbach A, Crespi B, Liu H, Flook P. Evolution, weighting, and phylogenetic utility of mitochon-drial gene sequences and a compilation of conserved poly-merase chain reaction primers. Ann Entomol Soc Am 1994; 87: 651-701. Genecodes. Sequencher version 5.0 DNA sequence analysis software, Gene codes corporation, Ann Arbor, Michigan 2011. Tamura K, Stecher G, Peterson D, Filipski A, Kumar S. MEGA6: Molecular evolutionary genetics analysis version 6.0. Mol Biol Evol 2013; 30: 2725-9. Edgar RC. MUSCLE: Multiple sequence alignment with high accuracy and high throughput. Nucleic Acids Res 2004; 32: 1792-7. Castresana J. Selection of conserved blocks from multiple alignments for their use in phylogenetic analysis. Mol Biol Evol 2000; 17: 540-52. Maddison DR, Maddison WP. MacClade 4: Analysis of phy-logeny and character evolution. Sunderland, Massachusetts: Sinauer Associations 2005. Goloboff PA, Farris JS, Nixon KC. TNT, a free program for phylogenetic analysis. Cladistics 2008; 24: 774-86. Goloboff PA. Analyzing large data sets in reasonable times: Solutions for composite optima. Cladistics 1999; 15: 415-28. Nixon KC. The parsimony ratchet, a new method for rapid parsimony analysis. Cladistics 1999; 15: 407-14. Swofford DL. PAUP–Phylogenetic Analysis Using Parsimony (and Other Methods). Sunderland, Boston, Massachusetts: Sinauer Associations 2002. Stamatakis A. RAXML-VI-HPC: Maximum likelihood-based phylogenetic analyses with thousands of taxa and mixed models. Bioinformat 2006; 22: 2688-90. Takaoka H. The geographical distribution of the genus Simu-lium Latreille in the Oriental and Australasian regions. Japanese J Trop Med Hyg 1996; 24: 113-24. Ali JR, Aitchison JC. Gondwana to Asia: Plate tectonics, pa-leogeography and the biological connectivity of the Indian subcontinent from the Middle Jurassic through latest Eocene (16635 Ma). Earth-Sci Rev 2008; 88(3-4): 145-66. Kohler F, Glaubrecht M. Out of Asia and into India: On the molecular phylogeny and biogeography of the endemic freshwater gastropod Paracrostoma Cossmann, 1900 (Caenogastropoda: Pachychilidae). Biol J Lin Soc 2007; 91: 621-57. Datta-Roy A, Karanth KP. The out-of-India hypothesis: What do molecules suggest? JBiosci 2009; 34(5): 687-97.